While we had an empty room to work with, I thought it prudent to address the floor. 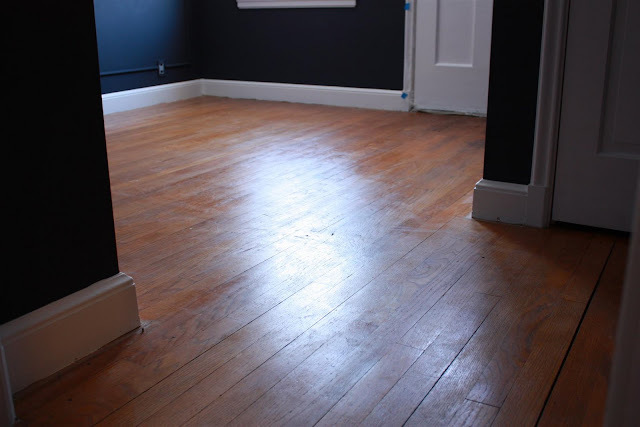 The wood floor in this room is pretty rough. It's got water damage, visible nails and has lost much of it's finish over the years. ...but I think you could use a t-shirt wrapped around a regular mop. I'm all about savings! I rocked the bottle gently to mix, then followed the directions, making large S-patterns on the floor and mopping with the grain. When I was done with the room, it was looking mighty nice! Uh huh. Your eyes aren't going, there really is no discernable difference. Maybe side by side will help to see it? Not really. Apparently, this stuff only works when there is actually poly already on the floor. Well, I'll be darned. 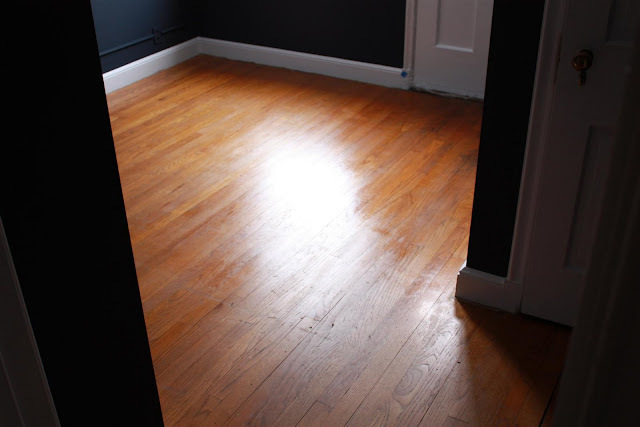 The areas of the room that still had some finish did shine up a bit. The rest, well it just looks clean. 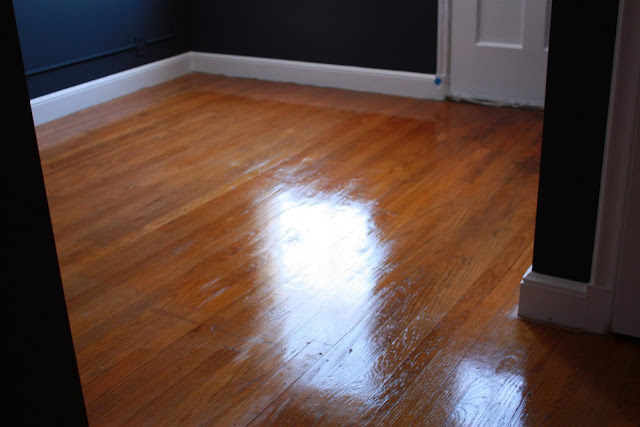 Even though I wasn't blown away by the results, I will definitely be trying this product on our floor in the living room and front hall, there are tons of scratches there already, and I'm interested to see how it does on floors with a nice newish coat of poly. Refresher aside, the Bona cleaner is the ultimate. Professionals recommend it, and it won't damage your finish or make your floors dull like Orange Glo can over time. I highly recommend it! I buy the Bona products at Bed Bath and Beyond, and the bonus is that you can use those 20% off coupons they litter your mailbox with on a weekly basis! Mops/pads - I'm really not sure anymore. Probably $20 for two pads and the mop itself. Thanks for the tip, and the demonstration! Our floors are recently refinished, but I'm going to keep this in mind to give them a little refresher in the future. Also, thanks for the comment on my blog! We have banged up floors, and I've been using Orange Glo - its ok. I was thinking about changing products, I'll have to buy a bottle of Bona! 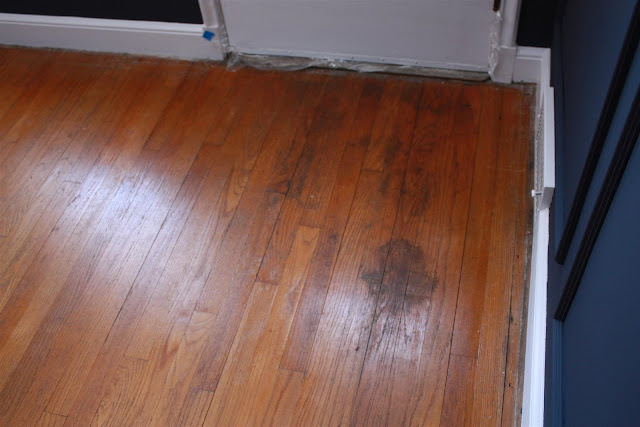 the last thing our wood floors need is residue - ick! 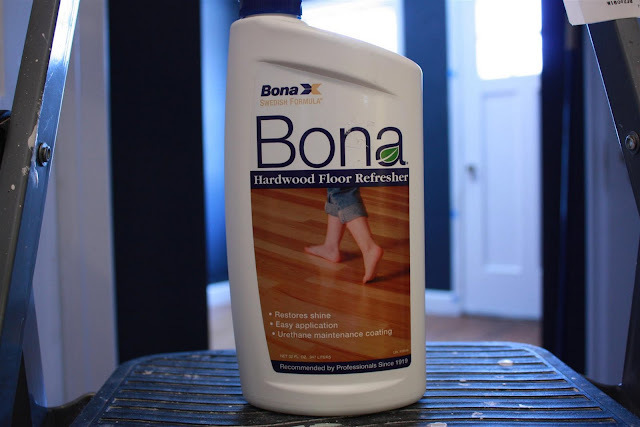 We just got our floors put in and I used the Bona cleaner last night! Love it! Glad that it comes so highly reccomendes too, and thanks for the BB&B tip. I was wondering where to get my refills. welp, at least your floors are clean! thanks for the product review, this stuff sounds great! The floors look REALLY clean. I use a dot of Joy soap in hot water to clean my wood floors. They feel so smooth afterwards. 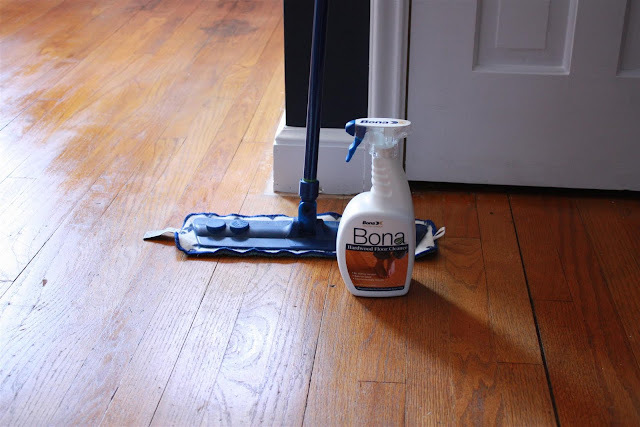 I've never used the Bona cleaner but am so glad for the tip! I'll be trying this out next time. I can see a LITTLE difference in the side-by-side! It looks a little richer and warmer now. 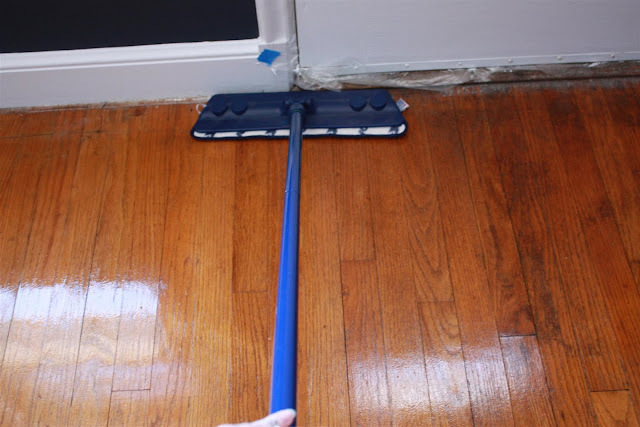 We just have hardwood floors in our dining room and kitchen, but I've been searching for a good cleaner. I'll have to try this Bona stuff! My wood floors are sooooo sad right now. And I've been waiting for after the kitchen reno (this March!) so my nicely refinished floors aren't damaged during all the construction. The refresher probably wouldn't do anything for my floors as they currently are either. It's good to know that exists though, and good to hear a good recommendation for a wood floor cleaner as I'm pretty clueless! My mom uses this stuff on her laminate floors and loves it. I haven't tried it. We use the Orbiter by Oreck. They have a wood floor cleaner and a wax also. My floors are like yours and I will say, it does work well, but it's a bit more expensive. Thanks for these tips! I think I'm going to try this product out as soon as we finish painting the walls in the den and dining room! Thanks so much! There is a little difference in the side by side comparison so all that work was not wasted. 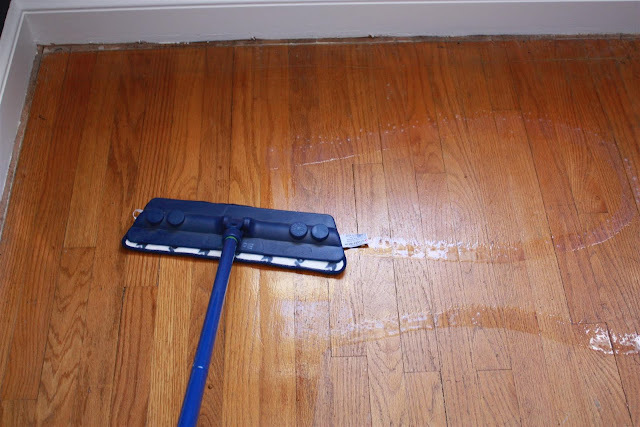 Thanks for the Bona tip....I have tried so many cleaners for our hardwoods and have not been satisfied. I am going to have to try that one. I am sitting here waiting for Bona Refresher to dry. First coat on. First time trying the stuff. Read very good reviews. While waiting, decided to kill time and do a search on photos if anyone post results. Loved your pictures and story to go along with it. Let me tell what I did first. I watched on youtube how to apply the Bona Refresher. Went on my hands and knees and scrubbed the baseboards. Then vacuumed 3 times. After I cleaned the floors twice with two different cleaners and then used my Shark steam floor cleaner. Went back over with a dust mop. Waited a while to make sure the floors were dry. 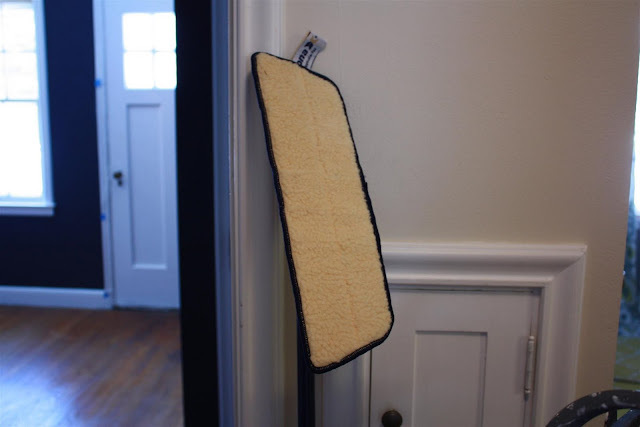 Then I applied the Bona Refresher with the microfiber applicator pad. It was very easy to apply.